One of the most significant events in the arena of climate justice took place when California’s Senate Bill 535 (SB 535) was signed into law, stated Charles Lee of the U.S. Environmental Protection Agency and one of the nation’s most prominent leaders on environmental justice. SB 535 mandates that at least 25% of the state’s Greenhouse Gas Reduction Fund investments go to projects that benefit disadvantaged communities. Colleen Callahan, deputy director of the UCLA Luskin Center, was one of four SB 535 leaders from California invited by Lee to meet with senior EPA staff and also speak on a panel at the National Environmental Justice Conference on March 12 and 13th in Washington D.C. In addition to Callahan, the other panelists were the “father of SB 535” Shankar Prasad of the California Environmental Protection Agency (CalEPA, and formerly with the Coalition for Clean Air); Mari Rose Taruc, organizing director for the Asian Pacific Environmental Network and coordinator of SB 535 Coalition; and Arsenio Mataka, assistant secretary of environmental justice and tribal affairs, CalEPA. The panelists shared the “backstory” of the efforts to conceive, pass and now implement SB 535. They provided first hand perspectives on lessons regarding their successes and challenges—past and present, as well as implications for other parts of the nation. Callahan emphasized that SB 535 and the Greenhouse Gas Reduction Fund (GGRF) represent a tremendous opportunity to advance climate justice. She also noted the challenge in implementing such a major and unprecedented initiative. Pulling from the UCLA report on SB535 entitled, “Investment Justice through the Greenhouse Gas Reduction Fund,” she provided key recommendations for implementing the GGRF to ensure the investments maximize environmental, economic and public health benefits for communities across California most in need. The recommended evaluation and performance management approach draws from an earilier report “Pathways to Environmental Justice: Advancing a Framework for Evaluation” created by the UCLA Luskin Center in collaboration with EPA and EJ leaders from across the nation. German Exchange Students Explore Policy in Los Angeles Hertie School of Governance students Niels Boehm and Oliver Loeffler share their experience studying at Luskin as part of an exchange program. 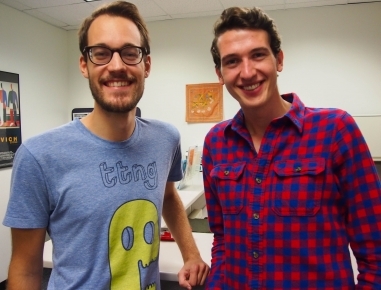 Niels Boehm and Oliver Loeffler traveled from Berlin, Germany to spend Fall quarter here at the Luskin School as part of a reciprocal international exchange program with the Hertie School of Governance. The Hertie School is a private governance and political science school in Berlin. Two Luskin students, Naoki Yamazaki and Hirofumi Kyunai, returned from Hertie in January. Boehm’s focus is on climate change policy, including energy and transportation policies. Loeffler studies international labor governance, looking at how governments can induce transnational corporations to uphold human rights standards. Before the two students returned to Germany last quarter, we asked them to share their experiences and unique perspectives with us about living and studying at UCLA and the Department of Public Policy at the Luskin School of Public Affairs. Luskin: Why did you choose to come to Los Angeles? Loeffler: I thought living in a mega-city such as LA would be interesting from a policy perspective. Luskin: Did you feel you could venture out into the city and get to learn about public policy that’s actually happening in LA? Boehm: I had a great course about transportation policy planning. Urban Planning professor Brian Taylor was very engaged in giving us the opportunity to get to know what we were learning about in class in real life. So we did a one day field trip and visited the major transportation policy and planning institutions around the city. That was a good experience because it linked the theoretical class debates to the real world. Loeffler: I think what’s good also about the Luskin school is that it offers programs which are directly related to the challenges here in LA and offers connections to other public policy courses. Boehm: This is also a great opportunity for us because we can take courses from different departments. I think that was also one of my major motivations to come to UCLA, that you offered students the opportunity to pick courses out of this really impressive curriculum. Loeffler: That’s a great point. My policy focus is on the frontier between the public and private sector. The exchange program offered me opportunity of studying at the management school (Anderson) which I would have never had studying in Berlin only. That’s a big asset of the exchange program — that you can pick courses you’re really interested in and help you advance your focus area. What’s also great about my stay here is that my girlfriend was able to visit me for a month. The scheduling of the university was flexible which allowed us to travel a little bit. We got a tent from the outdoor recreation center here at UCLA, rented a car and drove up the PCH. Boehm: Yeah I would also underline you have this great combination of studying and opportunities to do all kinds of things, whatever you want. Luskin: Was there any cultural shocks or things you thought were strange or funny about studying in America? Boehm: We’ve both traveled around the world to a lot of countries… but we got to see how things differ in terms of daily life. You have these dining halls here on campus, all this school pride for example. I mean we knew it existed, but to live it and to go to a college football game and tailgates was different. It was a cultural shock I would say, how huge the identification with the school is. Loeffler: In Germany we would watch American TV shows…and are aware of what’s going on in politics and society in the US. But living here and experiencing some of the major political and social discussions was a great experience. I got a much better feel about the inner functioning of this country. Luskin: Can you elaborate on the difference between studying in LA as opposed to Berlin? Loeffler: The structures of the courses are sometimes a little different and also in terms of class discussions, there’s a different style to it. But it’s not a difference of quality, just maybe the difference between the European and the American system. Luskin: Would you recommend your other classmates to come here in the future? Luskin: So, can you give your pitch for why your German friends should come to UCLA and why your American friends should go to the Hertie School? Loeffler: UCLA is the policy capital of the US and in the US there are a lot of policy challenges, especially topics related to urbanization and social inequality, which really crystalize here. We are in California, where a lot of innovative solutions are explored. UCLA offers a lot of resources to students and is a great campus and it’s a fun place to be. It’s California. Boehm: I think for Germany, my pitch is if you want to get to know Europe, Berlin is the best place to do it. Berlin is currently the most exciting city in Germany. Politically, its the most relevant city for both German and European politics. Also, it would be a great opportunity because it’s an English-speaking environment and Berlin has an international character, so you wont have any issues to get along with your language skills which can be a major barrier for people. If you are interested in learning more about the Hertie Exchange Program, there will be an information session on Thursday, March 12 from 12:30 – 1:00p.m. in room 4371. Naoki Yamazaki and Hirofumi Kyunai will discuss their experience at the Hertie School and answer any questions at the info session. Although the Hertie School program is a Master of Public Policy, many of the elective courses are relevant to all three Luskin School Departments. Applications will be due on Monday, March 23. California State Senators and Governor Jerry Brown gathered in Sacramento this week for the annual Democratic Senate policy retreat to discuss issues of statewide and national importance. J.R. DeShazo, director of the Luskin Center, briefed them on the economic benefits of California’s climate portfolio. The focus of his talk was the tremendous opportunity to build prosperous, healthy and livable communities through the State’s new Greenhouse Gas Reduction Fund (GGRF). The GGRF will soon have billions of dollars to support transit, clean vehicles, sustainable communities, energy efficiency, renewable energy, urban greening and more. Senate President pro tempore Kevin de León invited Professor DeShazo to be part of a three-person panel moderated by Senator Fran Pavley. Pavley authored AB 32, the landmark Global Warming Solutions Act of 2006 that propelled California as a global climate policy leader. Now the nation and world are watching as California implements an important element of AB 32, the cap-and-trade program, which places the world’s first economy wide cap on carbon pollution and establishes market mechanisms to price carbon credits. These auction proceeds go into the GGRF. Senate Bill 535 (de León) requires that at least 25 percent of the investments benefit disadvantaged communities. DeShazo shared stories about how programs funded by the GGRF have already provided real benefits to low-income communities and households across California, including through job creation, houshold energy cost savings, and clean air health benefits. Luskin Center research and event organizing is helping to advance the strategic and equitable implementation of climate investments to maximize local benefits to disadvantaged communities. For more information, see our SB 535 research report and this overview presentation. New York & California Incent Climate Change Innovation Differently DeShazo mediates discussion on climate change incentives in California and New York. On October 6, Richard Kauffman, Chairman of Energy and Finance at the New York State Office of the Governor, and Mary Nichols, Chairman of the California Air Resources Board, spoke with Dr. J.R. DeShazo of UCLA’s Luskin School of Public Affairs and Luskin Center for Innovation at the GloSho 2014 opening plenary titled, “Fireside Chat: Two Clean Economy Titans.” MIR presents edited excerpts from the conversation, focused on the public sector’s catalyzing role for innovation in both the California and New York clean-technology private sector. Reprinted from The Planning Report. J.R. DeShazo: What are the policy rollouts that are most important for private sector participation, in order to achieve climate change policy goals? Mary Nichols: If there is one criticism I would make about our metrics in California, which I usually brag about, it is that we’re doing too much—not that we’re doing too little. It’s hard for people to understand which proceedings they should participate in, where to go, and which agency to talk to. They’re all doing interesting and important things in many different sectors. We’re trying to address that issue in this administration through the work of the four energy agencies. It is amazing that, thanks to AB 32, the Air Resources Board is now considered an energy agency—even though for years we were doing work that had an impact on energy but were not ever considered to be leading in that space. I think those working in California for a long time have just gotten used to the fact that we’ve got the PUC, the Energy Commission, the Air Resources Board, and the ISO all involved, spending money, passing regulations, and coming out with policies. Every one of these agencies and all of the programs that we have, going back to the Pavley Standards and the first carbon registry in California, are now clearly coming together under the umbrella of climate change. We obviously want to—and must—keep the lights on. Of course, it needs to be affordable. Everyone is in agreement that by 2050, around 80 percent of all carbon and GHG emissions have got to be out of our economy. That is going to take a very big effort. Starting now, we have to find ways to get ourselves there. Richard Kauffman: I’ve been in the private sector and I know quite a bit about markets. I’ve been a clean-tech investor, so I know that the issues are less about technology, although we certainly need more innovation in technology. But there are plenty of good technology solutions. The real problem is that there are tons of market constraints and market failures that prevent solutions from coming to life. Generally, the energy sector is the most mature sector in the economy. It enjoys tremendous scale advantages. The utility industry is regulated, and in many cases, some fundamental regulations have not changed since the time of Edison. Understandably, there is a degree of conservatism about energy and electricity. We want lights to keep going and we want it to be safe. There are lots of issues that are appropriately conservative, but we have to get close and careful to see where the market barriers are. We also have to do the same thing with government policy. Sometimes when we give grants, the grants don’t lead to new markets or businesses. The government becomes the market. In New York, we’re trying to have a heavily market-led approach. In terms of our utility sector, we want to change the utility incentives so they are focused on having higher capacity utilization. Right now, the utility sector has 55 percent capacity utilization. How many industries that are capital intensive have 55 percent capacity utilization? None. There has been a revolution in the last 20-30 years about different business models, adaption technology, and changes in financial incentives, but they have not yet come to the electric utilities sector. That’s because the regulatory incentives haven’t changed. We pay utilities, and the way they get their profits is through getting a regulated return on capital. We can’t be surprised that we have low capacity utilization. We should think about the utilities as getting paid for efficiency, and we stimulate third party app providers to create competitive markets around customers. You need to draw in innovation to the end market and build the system from the customers-out as opposed to being a push model. With respect to government policy, I’ll give you one example: our residential energy-efficiency program. 70 percent of the houses in New York State are more than 70 years old, so there is a lot of opportunity to get energy efficiency from houses. We have a grant for somebody to do a residential audit, so residents don’t pay for that—ratepayers do. You can get a grant for up to 20 percent of the cost for the retrofit depending on your income. At the current rate of penetration of those programs, it will take 1,000 years. We’ve got to change government policy and programs so they can stimulate the market. The way to do that is to think about community aggregation. We want to focus the grants on the reduction of soft costs, and customer acquisition and financing costs rather than being the only source of their financing and support. Audience Question: As Chairman Kauffman mentioned, New York’s new energy vision has utilities rewarded more based on performance. Do you see California taking a similar approach? Mary Nichols: That’s been the philosophy for quite a long time. Our overall policy has been to separate the ability of utilities to make money from the fact that they need to provide energy-efficiency services. California has been the first state—now fortunately joined by many others—to separate the ability of utilities to get real return from the amount of sales of their product and pay them for energy-efficiency programs. That’s been probably the most fundamental change that we’ve made from early on. The directive is to the utilities, but also there is a financial incentive built into it. We are leading in terms of work that we get in our economy and our homes out of kilowatt hours of electricity. We are extremely energy efficient. But there is still a long way to go. There is no question that we need to develop some new and more effective ways of delivering retrofits of existing buildings and such, as Chairman Kauffman was talking about. The key thing here is that the electric utilities themselves are not the only providers of these services. The market must make it possible for others to function effectively in that space—especially when some utilities are regulated by the Public Utilities Commission and others are regulated by their local governing boards. The legislature has been struggling with this for a while, in terms of how they can set the right kinds of standards that will get the market to work better and get regulations to not be an impediment, but a better inducement. We’ve gotten a lot better in the transportation sector. The larger share of energy that we use in California goes to moving ourselves and stuff around our state, and the biggest sector of our economy is moving goods around. We need to think more broadly about the relationship between electricity and natural gas as providers of electricity and providers of transportation. That’s where a lot of the new thinking is going on right now—how to make that crossover work. J.R. DeShazo: For those unfamiliar, the chairwoman was referring to a decoupling policy adopted in the early ’80s by the CPUC. Richard Kauffman: I am immensely respectful of all the things that the chairwoman has said. The great thing about states, as Brandeis said, is that they are laboratories of democracy. It’s fantastic that states have been experimenting with things. California has been a leader. We have decoupling in New York, and what we’re talking about is going beyond California. The issue with decoupling is that it makes utilities indifferent as to the quantity of electricity their customers consume. It doesn’t create a proactive incentive for system efficiency or for things that relate, as Chairwoman Nichols said, to what is going on around customers. New technology is providing opportunities to think about what it means to be a utility in terms of monopoly. The whole concept of a monopoly depends on the collective being cheaper than the individual. But if the technology changes so that the individual becomes cheaper than the collective, the logic begins to break down. In Brooklyn, which is growing very rapidly, ConEd the utility would have spent $1 billion for a new substation—which would add about 55-57 percent capacity utilization, built for the hottest few hours or days of the year. That’s a lot of money paid for by all ratepayers, in terms of rates and power costs, which are very high in New York State in the summer and, increasingly, in the winter. The alternative, which is now going to happen, is that instead of that $1 billion investment, they will be providing power through distributed generation using natural gas, solar, and demand-response energy-efficiency measures. That will cost ratepayers less and will result in a cleaner, cheaper system. The way it’s being implemented is interesting: Utilities released enough data so that they’re getting all kinds of innovation from the market about how to solve this problem. We’re going to create competitive markets around customers. We’re going to free up data and let a whole variety of service providers come in with a whole variety of solutions that are going to help the utility become more efficient, but also help provide more choices and variety to customers. Audience Question: What is the onramp for entrepreneurial technology companies that wish to deal with utilities in California? Mary Nichols: To pick up on what Richard was saying, it’s not going to come from the utilities themselves, clearly. Government policy does play a critical role here in enabling the implementation of new technologies. I think the source of innovation about financing and providing energy services is coming through the ISO. It is creating new markets for services other than plugging new plants into the system and getting power purchase agreements through the utilities. They are partnering with the Public Utilities Commission and the Energy Commission, in terms of allowing for other ways of services provision and other ways of demonstrating that the lights will stay on. I completely agree that the solution for the longer term is not just about building more plants. We’re actually dealing now with the issue of what to do when there is an oversupply of electricity at certain times of the day and the year. That’s a small issue now but is going to be a much bigger one in the years to come, as we bring online more solar, wind, geothermal, and other facilities. Instead of being worried about whether there will be enough to serve the demand at peak times, we are now worried about shedding load, which is a waste and a bad thing to do from an economic perspective. We’re thinking about how to make sure those electrons are being stored and used appropriately. From the state’s perspective, we’re trying to responsibly look at the whole system and allow it to balance itself in the most efficient possible way. J.R. DeShazo: I would add—because it’s sort of taken for granted in Chairwoman Nichols’s remarks—that if you’re a utility today in California, you have a set of push and pull factors. The push factors are the RPS and other state legislative requirements. The pull factor is the cap-and-trade program, which is changing the price of your kilowatt-hours as a function of the carbon content. Those incentives are acting actively now in California. Richard Kauffman: I would add that when we’re thinking about clean-tech, we have to allow for the possibility that not everybody is motivated by saving the planet or saving money on electricity. When Edison helped set up the electricity system, he thought it was only going to be about lighting. Even in his own lifetime, he saw it become much more than just lighting. I think the technology you guys are all developing provides a lot more value potentially for the electricity system than we have today. Nobody gets up and says, “I want to make more electricity.” It’s what the electricity system provides in terms of value. I talk to healthcare companies that say, “We want to improve the quality of home health care and reduce costs by at-home health care monitoring. That’s going to require a home automation system.” Apple wants to provide more entertainment through a home automating system. The drivers for a new electricity system could be convenience, comfort, and health. That has potential for a much more energy-efficient system, but the driver may be other things than just saving money. That’s why it’s so important to get innovation in the market. Audience Question: Chairman Kauffman, I want to thank you and NYSERDA for funding a grant that my company seeded in early 2000 to study a hybrid biogas wind program for Wyoming County. Now, we’re faced with those issues in the Central Valley—yet, we have not seen the whole commercialization of biogas to reduce methane, to reduce NOx precursors, and the associated water issues. What are your agencies doing to promote those solutions? Richard Kauffman: I think you have identified a classic problem of how we need to evolve our government policy. These projects would be supported by a grant here or there. It’s not really creating a market. I’m not saying that grants or incentives may not be necessary, but is that the only mechanism that we’re going to use? We’re working in this area to make sure that the projects are really local. Is the cost for the developer and the customer acquisition cost really high? If you lower the developer cost, you’re going to get more projects done. How do you lower the development cost? One way is to identify if projects are located next to something else—and whether the gas or electricity could be useful to the rest of the system. Let’s develop projects where it’s going to be better for the system. How can we get local communities or governments involved in this, where there are opportunities for them to save money? Right now, each local government has to figure it out on its own. Is there a way to create a mechanism where there are off-the-shelf solutions that local governments can use? Government can do things like convening, which doesn’t cost a lot of money. Another example is financing. Project financing is difficult for small projects. This isn’t about subsidized financing. We have a green bank that can do things like provide an aggregation facility for financing. These projects are just a few millions dollars—and it’s very hard to get a bank interested in that kind of money. But if the green bank can provide an aggregation facility, then you can actually provide the financing market for the private sector. Mary Nichols: This is not in any way to dismiss the abstract of what you’re saying. But I want to focus on the practical problem of methane and dairies as a practical example of the range of issues involved and how the right mix of policies, regulations, and standards are necessary elements of the overall solution that will also drive investment. We have dairies in the Central Valley of California that are located near each other. We’ve actually had dairy owners willing to volunteer to try to host digesters on their land. We have a problem with nitrate in the water, and we have a problem of needing renewable natural gas. We have a problem of wanting to get methane out of the air. So we have all these reasons why we would like to make this system work. We can set pipeline standards to get this stuff into the pipeline. We can promote the best technology that is now in the early stages. We can’t make it economical for the dairy owner to truck the waste from the cows to a central location. The cows in the dairies are not located in a place where it’s convenient to put in some megafacility all in one place. We actually need to create, or have someone create, a company that would go out there and work to finance these things—aggregating a lot of these projects together. That would be the sensible market solution. But until there is a sense that there is a long-term commitment to this—that there’s money out there to help finance it, there are regulatory tools in place, and targets that they’re going to meet (probably in terms of the nitrate standard for the underground water supply)—it’s not going to come together. Not to say that this isn’t the way it should go— just to say it’s going to take, still, a lot of work on the part of a lot of people to implement a solution that we all know is the right thing to do. November 10th — Los Angeles Mayor Garcetti announced today a new, industry-leading energy efficiency commitment for the city’s utility, with the goal informed by a new UCLA study addressing the economic and employment benefits of Los Angeles Department of Water and Power’s (LADWP’s) energy efficiency programs. Speaking at the press conference with the Mayor, UCLA Luskin Center Director J.R. DeShazo drew attention to the study, which finds that LADWP’s diverse portfolio of energy efficiency programs already creates 16 job-years per million dollars invested, and that a full implementation of these programs into 2020 could result in nearly 17,000 job-years in Los Angeles County. The release of the UCLA Luskin Center study today came after LADWP commissioners recently approved a commitment to a 15% reduction in electricity consumption in Los Angeles through energy efficiency measures. David Jacot, Director of Energy Efficiency at DWP, recommended this goal using the jobs study as proof of the positive economic and employment benefits of energy efficiency programs. Efficiently Energizing Job Creation in Los Angeles highlights the importance of energy efficiency efforts. Obvious benefits include reduced air pollution and decreased burden on the electric grid, while the study specifically quantifies the numbers and types of jobs created by LADWP’s existing energy efficiency programs. After analyzing LADWP’s diverse portfolio of 18 energy efficiency programs, UCLA researchers found that those programs create an average of 16 job-years per million dollars invested in Los Angeles County. The 18 programs researched in the UCLA study generally come in two varieties—direct install or incentive/rebate based–and deal with new construction as well as retrofits of existing building stock. Examples of these two types of offerings include programs such as the Small Business Direct Install, which provides small business customers actual energy and water-saving installations at no charge, while others such as the Customer Performance Program offer customers an array of rebates and incentives to encourage retrofits in lighting, air conditioning, refrigeration, and more. The study found that the programs benefit all types of LADWP customers—industrial, commercial and residential, including low-income and senior citizen life line customer. These programs also have the added benefit of stimulating growth among a wide set of skills and trades, from electrical, plumbing and construction to engineering and design, and the investment in these programs were found to have significant ripple effects in the local economy. The authors of the study note that 16 job-years per million dollars invested is significantly higher than legacy energy production methods like coal and natural gas, as well as “typical” job-creators like construction, which create 6.9, 5.2 and 10.7 jobs respectively. It is even higher than other green industries like solar and smart grid, which create 13.7 and 12.5 jobs respectively. This research fills a big gap in accurate job creation numbers associated with specific types of energy efficiency programs, and will hopefully serve as a model that other utilities around the country can use. Moving forward, the programs could create over a quarter billion dollars annually in economic output. Forecasting through 2020, the Luskin Center study finds that LADWP energy efficiency programs would create nearly 17,000 job-years in Los Angeles County as the programs are currently designed. White House Highlights Luskin Center Report UCLA Luskin Center research on clean energy solutions for Los Angeles cited by White House. (Los Angeles, CA – July 29, 2014) Los Angeles County is currently leaving around 98 percent of its solar capacity untapped. Achieving just 10 percent of its rooftop solar potential could create 47,000 jobs and slash nearly 2.5 million tons of carbon dioxide emissions annually — the equivalent of taking about half a million cars off the road — according to maps released today from the UCLA Luskin Center for Innovation and Environmental Defense Fund (EDF) and highlighted in a White House announcement. The Los Angeles Solar and Efficiency Report (LASER) is a data-driven mapping tool designed to help communities identify opportunities to invest in projects that will save households money, create clean energy jobs, and strengthen climate resiliency in vulnerable communities. Maps show the region’s clean energy potential — in the form of rooftop solar energy generation and energy efficiency upgrades — which can reduce greenhouse gases while creating jobs and cutting electricity bills. LASER also illustrates climate change-related heat impacts that are expected in the Los Angeles region, with a focus on the 38 percent of L.A. County residents (3.7 million people) living in environmentally-vulnerable communities burdened by air pollution and other risk factors, as identified by the California Communities Environmental Health Screening Tool (CalEnviroScreen). Based on analysis of CalEnviroScreen data, the report highlights that fully 50 percent of the state’s most vulnerable population lives in L.A. County. The State of California is expected to use the CalEnviroScreen to identify disadvantaged communities for the purpose of prioritizing funding from the state’s Greenhouse Gas Reduction Fund. “The project is timely because with new state funding sources becoming available, LASER can help inform how the region invests resources to address pressing environmental challenges while providing job opportunities in its most impacted communities,” said Colleen Callahan, lead author of the study and deputy director of the UCLA Luskin Center for Innovation. “Data mapping tools like LASER provide powerful visualizations of the harmful effects that climate change can have on our most vulnerable populations, while highlighting the potential for significant economic growth and substantially healthier communities,” said Jorge Madrid, EDF’s senior partnerships coordinator. The maps are a response to President Obama’s Climate Data Initiative, a call to action to leverage public data in order to stimulate innovation and collaboration in support of national climate change preparedness. Alarming scientific findings from the National Climate Assessment show that climate change is already impacting all parts of the U.S., and arid regions like L.A. County can expect more intense heat waves in the coming decades — making resilience critical. The LASER project provides detailed, newly updated data at the County and municipality level designed to help policymakers and the public prepare for a warmer future. Maps demonstrate estimated temperature increases, current environmental health risks, and climate change vulnerability in various parts of the region. Parcel-level analysis gives planners and property owners detailed information about which buildings and other spaces across L.A. County are ripe for solar panel installation and energy efficiency measures. Taken as a whole, the project paints a comprehensive picture of clean energy opportunities in Southern California, and demonstrates the potential economic benefits of sustained investment in these strategies. The research is part of UCLA’s Grand Challenge project “Thriving in a Hotter Los Angeles,” which sets a goal for the Los Angeles region to use exclusively renewable energy and local water by 2050 while protecting biodiversity and enhancing quality of life. 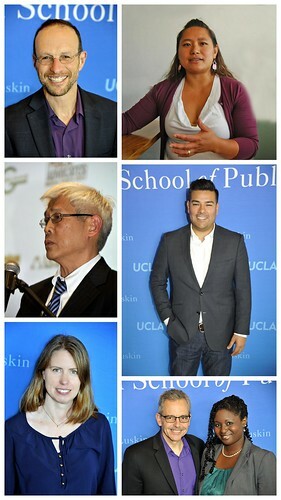 UCLA Luskin Center for Innovation (innovation.luskin.ucla.edu), unites scholars with civic leaders to address pressing issues confronting our community, nation, and world. The Luskin Center produces research that informs public policy, with a focus on advancing environmental sustainability and innovation. Environmental Defense Fund (edf.org), a leading national nonprofit organization, creates transformational solutions to the most serious environmental problems. EDF links science, economics, law and innovative private-sector partnerships. Connect with us on Twitter, Facebook, and our California Dream 2.0 Blog. California legislators approved a State budget on Sunday, marking a historic investment in climate action and local benefits especially for low-income communities. The budget allocates $832 million in appropriations from the Greehouse Gas Reduction Fund to investments like sustainable communities and clean transportation, while leaving some process and project-level details yet to be determined. The UCLA Luskin Center for Innovation released a REPORT today that could help fill in some of the details, proposing a systematic approach for implementing the investments. With proceeds from the cap-and-trade program, California’s Greenhouse Gas Reduction Fund will soon result in billions of dollars to reduce carbon pollution while creating local economic, environmental, and public health benefits. Senate Bill 535 (de León), which became law in 2012, requires that at least 25 percent of these monies go to projects that provide benefits to disadvantaged communities in California. Through the leadership of Senator de León, neighborhoods that need it most will see investments in transit, affordable housing, and energy efficiency. Establish a performance management approach for assessing program and project investment options (ex-ante) and tracking their results (ex-post). This approach would start with principles and goals contained in the germane state laws. Adopt criteria to screen, and indicators to score, investment options. The criteria should encompass and actualize the aforementioned goals, and all investment should be required to meet the eligibility criteria. The indicators should operate in a scoring system that prioritizes projects that achieve as many benefits as strongly as possible, while providing flexibility in how that is done. Select projects that meet SB 535 requirements by using metrics and thresholds to assess disadvantaged community benefits. Members of disadvantaged communities should have the opportunity to help define, to the extent feasible, investment priorities that then should inform corresponding metrics and performance targets/thresholds. Advance methods and data to make best use of the performance management approach. The State does not yet have sophisticated methods to estimate the co-benefits for disadvantaged communities, or even a common method for estimating how investments would achieve the primary goal of greenhouse gas reduction. This report makes recommendations for advancing these methods. The report also contains considerations for making strategic and equitable investments in specific investment sector areas. Top priorities identified at this workshop as important for disadvantaged communities are reflected in the budget approved yesterday. This includes transit and low-carbon transportation, affordable housing and sustainable communities, weatherization and energy efficiency as well as sustainable urban forests programs. Many of the recommendations in the report were informed by 150 representatives from disadvantaged communities, academia, government, civil society, and the private sector who participated in the UCLA hosted workshop. For more information, see the REPORT and event WEBSITE with resources related to SB 535. 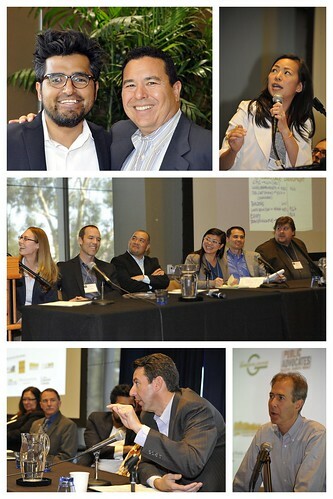 The Luskin Center convened 150 leaders in government, nonprofits, academia and the private sector on March 21 for a workshop designed to advance climate action in disadvantaged communities. California’s Greenhouse Gas Reduction Fund is expected to generate tens of billions of dollars over the next decade to mitigate climate change and create local benefits. Senate Bill 535 (de León) requires that 25 percent of these monies go to projects that provide benefits to disadvantaged communities in California. “This may be the largest environmental investment opportunity that these communities will see for decades,” stated J.R. DeShazo, director of the Luskin Center as he opened the workshop held at UCLA. But many questions exist about revenue allocation and implementation. 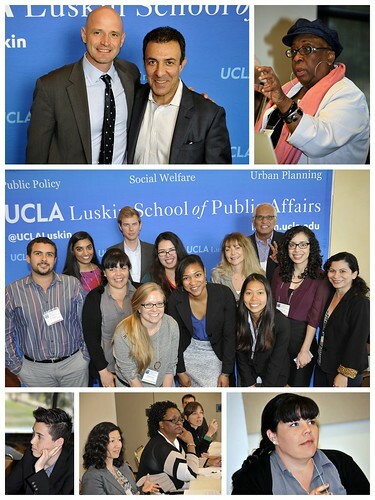 The Luskin Center hosted convening supported the development of an analytical and equitable approach for this process. Participants helped identify and refine evaluative criteria to guide investment decisions and performance metrics to track results of the investments for accountability and transparency. A summary of recommendations for a performance metrics tool will be released by UCLA later this year. The convening was a partnership with the SB 535 Quad. State Senator Ricardo Lara’s keynote address underscored what is at stake. Millions of Californians are struggling economically and breathing dirty air while climate change will exacerbate economic and environmental health risks. Charles Lee, a national environmental justice leader with the U.S. Environmental Protection Agency, put the event in a national context, stating that environmental actions in California become models for the rest of the nation. “We are here to build on the momentum started by many of you in this room who organized to pass SB 535, and are now working to fulfill the State’s promise to invest cap-and-trade revenues to benefit California’s disadvantaged communities,” DeShazo added. Among these leaders were Marybelle Nzegwu at Public Advocates, who introduced Senator Lara’s keynote address at the workshop, along with Bill Magavern, policy director of Coalition for Clean Air, and Mari Rose Taruc, state organizing director for the Asian Pacific Environmental Network. Mari Rose and Bill presented on the key laws in California including: AB 32, the Global Warming Solutions Act of 2006 that led to the cap-and-trade program, as well as SB 535 and AB 1532, which require that cap-and-trade revenues result in environmental, public health, and economic benefits for communities in need. “We know the people in California that will be the most hurt by climate change are people with the least resources to face this problem,” stated Taruc. Yet as Magavern pointed out, the State has not yet defined what it means for an investment to “benefit disadvantaged communities,” and thus we need funding criteria and tracking mechanisms to verify that these investments are truly benefiting hard hit communities. Clifford Rechtschaffen, senior advisor for Governor Brown, spoke about the process and opportunities for SB 535 implementation. “We must make the disadvantaged community investment process inclusive, transparent, and accountable,” he stated while disclosing the State’s intent to hold public workshops on SB 535 implementation. Rechtschaffen also discussed CalEnviroScreen, a tool the State developed to identify disadvantaged communities for the purpose of SB 535 implementation. “CalEnviroScreen can help the cap-and-trade program go to communities that most need it,” stated Rechtschaffen. Manuel Pastor, professor and director of the Program for Regional and Environmental Equity at USC, underscored the importance of this tool, which his research helped inform. The State’s tool measures cumulative risk, using a variety of environmental health and socioeconomic indicators. Paving the way for the workgroups, Pastor then explained that each participant was grouped into one of six investment-sector focused sessions: 1) Sustainable Communities Strategies Implementation; 2) Low-Carbon Freight Transport; 3) Zero-Emission Passenger Transportation; 4) Energy Efficiency and Residential Weatherization; 5) Clean Renewable Energy; and 6) Community Greening and Forestry. The charge for participants was to serve as policy analysts within their investment sector area. Pastor implied that the agenda for the workgroups was ambitiously aligned with a complex State process, but employed participants not to be intimidated by it. He spotlighted the important perspective of the environmental justice and community leaders in attendance. The Greenlining Institute’s Vien Truong then made a presentation on “Criteria and Metrics.” Truong defined the terms as: “Principles capture broad goals, criteria are the objectives, and metrics are how we get there.” She proposed five criteria to drive funding allocation at the program level. The criteria were compiled by the UCLA Luskin Center and the SB 535 Quad, and derived from the relevant laws. The breakout sessions that followed were designed to allow participants to refine the criteria and propose corresponding metrics. Each group discussed programs in their investment sector for which the criteria and metrics could be applied. Each of the six sessions began with presentations from State agency leaders who spoke about existing programs eligible for funding from the Greenhouse Gas Reduction Fund, per the State’s current Investment Plan. The groups then identified whether there were programs in their investment sector not on the table that should be eligible for funding in future three-year investment cycles. Finally, each group provided recommendations on how programs could best be implemented to benefit disadvantaged communities. After hours of discussion, the six groups came back together. Colleen Callahan, deputy director of the Luskin Center, facilitated a panel in which a representative from each group summarized their discussion. Common themes across the groups included the importance of transparency and authentic community engagement; and leveraging of complementary programs across sectors. Proceedings from these discussions will be included in a report that the Luskin Center will release later this year. Hector De La Torre, board member of the California Air Resources Board, emphasized the need to show immediate results to fend off law suits. “We need to show the money is going to the things the law says it will go to,” De La Torre said. Chief Ken Pimlott, director of the California Department of Forestry & Fire Protection, proposed that urban forestry could be a solution to the need for immediate results. “The state has a proven track record investing in urban forestry, and we can show results through projects in urban forestry,” Pimlott said. Catherine J.K. Sandoval, commissioner of the California Public Utilities Commission referred to the importance of selecting appropriate existing programs to fund and in the longer-term, even updating or adding new programs to best address the needs of disadvantaged communities. J.R. DeShazo closed the workshop with a call for continued collaboration. He invited attendees to provide additional comments and review the post-workshop report. This report will contain recommendations for the State to achieve investment justice from the Greenhouse Gas Reduction Fund, to ensure that the investments combat climate change while providing tangible local benefits to hard hit communities. The UCLA Luskin Center and the Environmental Defense Fund (EDF) released new maps as part of the Graduated Density Zoning tool designed to help local leaders identify opportunities to invest in clean energy jobs and strengthen climate resiliency in vulnerable communities. The maps are a response to President Obama’s new Climate Data Initiative, a call to action to leverage data in order to stimulate innovation and climate change preparedness. “The UCLA Luskin Center, along with our research partner the Environmental Defense Fund, looks forward to being part of a national movement bringing data to bear to help communities, companies and citizens effectively prepare for climate change,” said Colleen Callahan, deputy director of the Luskin Center. The maps debuted at the Investment Justice through the Greenhouse Gas Reduction Fund working conference on March 21 and also at the Environmental Forum hosted by Assembly member Mike Gatto on March 29. “Data mapping tools like the LASER Atlas provide powerful visualizations of the effects that climate change can have on our most vulnerable communities, while also highlighting opportunities for economic growth, job creation and increased resiliency,” said Jorge Madrid of the Environmental Defense Fund. For example, one map underscores that disadvantaged communities in L.A. County are benefiting from the installation of rooftop solar, with over 1,400 solar systems in low-income neighborhoods in just the investor-owned utility areas of the county alone. Yet another map in the LASER Atlas shows that we are only beginning to tap into L.A. County’s tremendous capacity to generate solar power. And doing so could reduce the need to fully operate polluting power plants in the region. The maps also illustrate that residents of L.A. County are disproportionately impacted by environmental risks but, in turn, could disproportionately benefit from upcoming investments from the Greenhouse Gas Reduction Fund. This Fund provides a new opportunity to invest in renewable energy, as well as clean transportation and sustainable communities, to combat climate change and create jobs. SB 535 requires that at least 25 percent of the monies from this Fund go to projects that provide benefits to disadvantaged communities. The LASER Atlas research contributes to UCLA’s Grand Challenge Project “Thriving in a Hotter Los Angeles,” whose goal is for the Los Angeles region to use exclusively renewable energy and local water by 2050 while protecting biodiversity and enhancing quality of life. On Thursday, January 23rd, the Luskin Center for Innovation hosted a lecture by Dr. Renée Kidson. 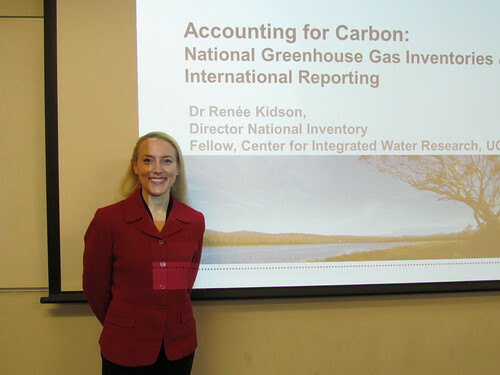 Besides being an expert in water management, an economist, and a Major in the Australian Army, Dr. Kidson is also the Director of the Australian National Greenhouse Gas Inventory – she is the chief administrator for the process of tallying up, as best as possible, the total sum of greenhouse gases emitted throughout all of Australia. With nations around the world struggling to adapt to the effects of climate change, there is a growing recognition of the importance of international cooperation to mitigate this global issue. The key UN treaty that seeks to regulate this area is the UNFCCC, which mandates that every signatory must submit a national greenhouse gas inventory annually. Such a task is obviously immensely complex. Dr. Kidson elaborated a bit on the overview of how that task is accomplished, and where it can become problematic. Focusing on an overall emissions result can mask dynamic changes occurring in each of these areas. Australia has actually successfully come in under its international GHG target for the last 5 years, mostly due to reforms and improvements in its land use and forestry policies. One of the questions that comes up immediately is how reliable are the data that are aggregated in these projects. Dr. Kidson acknowledged that this is of course an incredible challenge – adjustments must be made for small or transient businesses that go unreported, statistical uncertainties, and other factors. But she also highlighted complex mapping and software tools, stringent reporting and regulatory efforts, and a surprisingly participatory tone among Australia’s business community as factors that helped the government’s effort.